International Travel on the Cheap! Italy is a wonderful place to visit. I happened across a sale on the United Airlines website from Houston to Milan for about half the regular price to Rome. (See the post on airfares.) Ruth and I hopped on this one in an instant. Even though we had enough miles for the trip on our United Airlines card, I decided to pay cash since it was such a good deal and save the miles for later. Of course I charged it on the United Card so we got free baggage and more miles. I love it! We decided in advance that we were not going to rent a car and try to go everywhere by train or bus. I have mixed feelings about this now that the trip is over. Getting around in the stations, rushing to the tracks and dragging baggage on and off the trains was a bit daunting, but a great experience to have at least once. 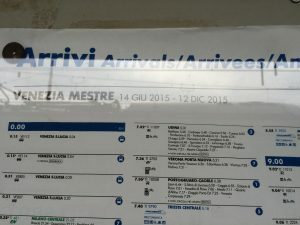 Train schedule posted at the Venice Mestre station. want to go and then watch the electronic board that will flash your train number with the destination and the track number. The town names in Italy are not what we are used to in English. (Maybe we can thank or blame the US and British soldiers from WWII for changing them!) Most are similar like Rome is actually “Roma” (did we really need to change that?) 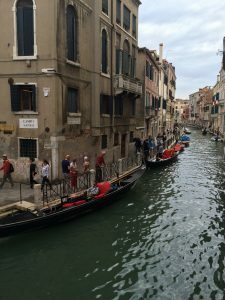 Venice, however, is “Venezia” so you might note these when planning your trip. The same is true for other European countries. You can go first class or second class on the trains for a small difference in price. Generally, Ruth and I didn’t feel that there was enough difference between first and second class to warrant the extra money, The boys felt the opposite. We sometimes moved into First Class on the train and paid the difference. The tickets are not for a specific time so be sure to insert your ticket into the machine on the platform to date stamp it before you board and be sure to have your ticket handy on the train, it will be checked. There is a car with drinks and hot and cold sandwiches usually between first and second class. Don’t wait until the end of the trip as they often run out of the more popular items. There is a wine cart that circulates in first class. gave me a tip to get Rick Steves’ book on Italy. It was spot-on most of the time. We even bought his guide to Rome which was helpful as well. Venice is a collection of islands that is a bit difficult to navigate in. There are no cars on the islands, so transportation is on foot or water taxi. There are some fellows with carts that will carry your bags and guide you to your hotel for a fee. 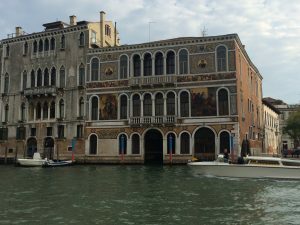 Rick Steves says to stay in Mestre, the station before the end of the line at Venice. We rented a place there through Air B&B. I thought it would be good because the owner noted she spoke English. It turned out the place was way farther from the train station than the map showed, but we got there finally. Then it turned out that the owner ment an “English Room.” Having never heard of that, (and not finding it defined anywhere on the internet, the fountain of all knowledge both true and untrue), she explained that all 4 of us would sleep in a small room with wall to wall beds. Not gonna happen, the sleep part anyway! 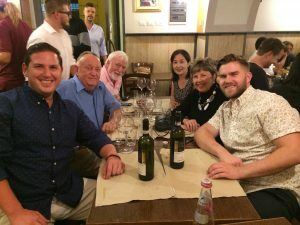 It was too late to move that night so we looked and looked for a place to have our first Italian dinner. After walking for hours, we finally went in a pizza place run by an oriental family. 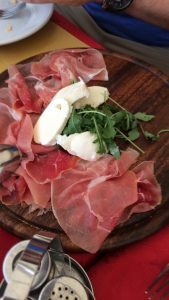 We ate at a Pizza Place in Mestre. Not huge on atmosphere, but the food was good. We were hungry and it was good, but not what we had in mind. I think Rick Steves is off base here. The next morning we found the Hotel Continental in Venice just out of the train station and to the left down the street. It even has a neat little dining area right on the canal as well as a formal dining room. 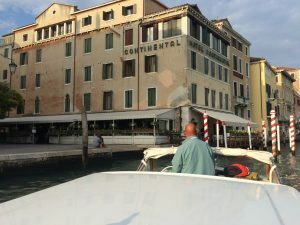 The price for rooms at the Continental was much higher (about $200 for a double room) than the “English Room” in Mestre , but good by comparison to other hotels in Venice and lightyears better than being in Mestre. A quick train ride back to get our stuff and stow it at the hotel and we were off to see the sights. We spent a couple of days here, but you could probably be okay with a single, full day if time was short. 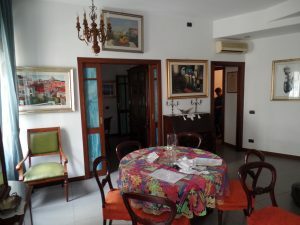 When we checked out, it was an easy stroll from the Continental through the throngs of tourists to the train station and the next leg of our journey to Rome. The fast train really moves along. You can check the speed with a compass or map app such as “Commander” which showed our speed somewhere north of 160 mph most of the time. Ruth refused to look at the app! When we arrived in Rome we took two taxis (they are small) from the train station to our next Air B&B place hosted by Valerio. This one was a two bedroom, two bath large apartment in the neighborhood of the Colosseum. Now this is more like it! We spent about a week here and were able to walk to a nice supermarket to buy coffee and wonderful Italian meats and cheeses. It was gastronomical heaven between this and the wonderful restaurants we found. (There are no BAD restaurants there!) The key to selecting a good place to stay is to read the reviews and get a place that is near to the subway and restaurants. Next time, we may stay in the area of the Pantheon. 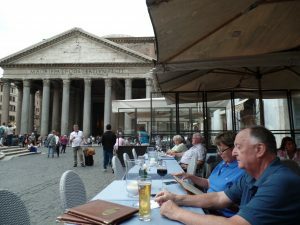 Not only is the Pantheon an amazing “must see,” but we kept being drawn back to that area to eat and explore. 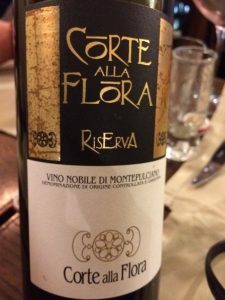 I think we drank all the Corte alla Flora Wine except for one bottle which we finished off a couple of nights later. Next Post:Where did we put those old Pesos from our last trip to Mexico?